Starting a newsletter is pretty easy, thanks to tools like Mailchimp, Benchmark Email and Constant Contact. But starting a newsletter that people actually want to read? That’s much harder. 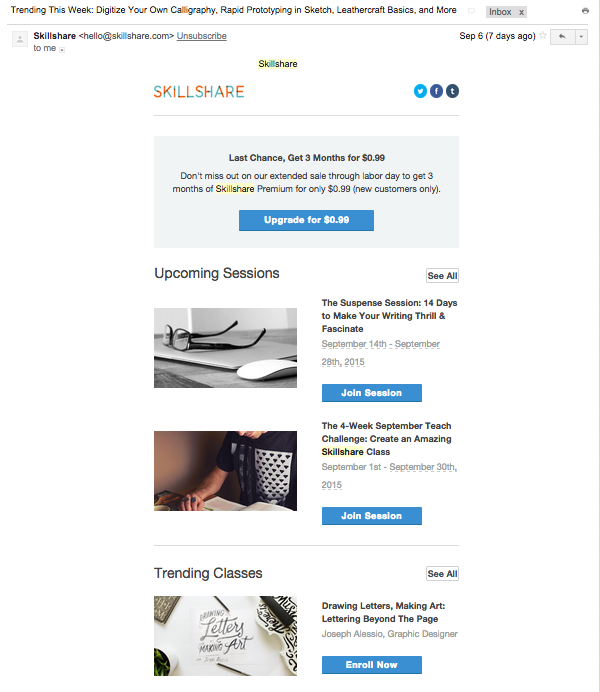 First, we’ll show you five examples of well-executed email newsletters. Then, we’ll dive into which model is best for your specific goals and product. Maple is a gourmet food delivery service. The lunch and dinner menus are small—think three or four items each—and change everyday. Rather than expecting people to proactively go to the Maple site, check out the options, and place an order, Maple’s newsletter does all the work for them. Each day, at 11:15 AM, Maple sends its customers an email titled: “Today’s Lunch Menu: [Date] at Maple].” The same email goes out at 5:15 PM—except it’s called “Today’s Dinner Menu: [Date] at Maple,” and now lists the dinner options. Be consistent. The send time, title, and design of the Maple newsletter never change, which means customers know exactly what to expect. Make it novel. Despite the unchanging details, one thing does vary: the food. Even if they’re not planning on ordering anything, people are curious to know what’s being served. Put an emphasis on design. From the high-quality photos to easy-to-read text, reading this newsletter is a pleasurable experience. 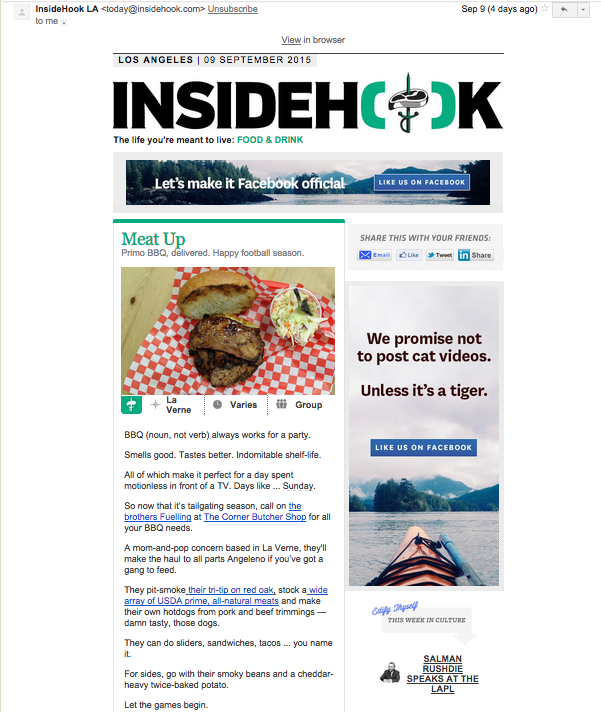 InsideHook is a “city guide for adventurous and established men”—so why do I, a twenty-something college student living in a small town, subscribe to its email? Simple: It’s a really awesome newsletter. Interestingly, InsideHook doesn’t just link to its own articles. The newsletter highlights interesting, timely pieces from around the web. The entertaining/educational split is a guaranteed way to please your readers (which will boost your open and forward rates). You can appeal to people outside your target audience by delivering great content. If you want to lessen the promotional feeling of your newsletter, bring in outside sources. Think of Brilliant as Wikipedia for math, science, and engineering. Its site is worth checking out, but its daily newsletter is truly brilliant. Around 12:30 AM every night, I get a Brilliant email with a mind-puzzling problem. They’re the kind of problems that you absent-mindedly read—then can’t forget about until you know the answer. To see the solution, you have to click through to the Brilliant website. From there, it’s super easy to get sucked into a problem-solving binge. Give your email subscribers a reason to click through to your site. Make your newsletter interactive. This feature transforms your readers from passive to active participants. Arouse your subscribers’ senses of curiosity—whether that’s with a brain-teaser or an intriguing subject line. Levo League sends out a ton of newsletters, including Perks (sweepstakes and contests), Announcements, The Brief (a “daily dose” of trending stories), The Slice (a weekly version), Fashionable Fun, and Must Reads. What’s the rationale behind all these emails? Levo clearly understands that its audience—career women—has diverse interests. By creating niche newsletters for those interests, from fashion and news to pop culture and freebies, the company can serve up personalized content to its users. If there’s a lot of variety in your audience, consider segmenting it so you can send each subset a customized newsletter. Similarly, if the topics you want to cover feel too random to belong together in a single newsletter, desegregate them. Use your newsletter to make yourself an authority or trusted voice in your space. Skillshare is an online learning community, offering unlimited access to classes like Food Photography: Shooting at Restaurants and Introduction to HTML: Build a Portfolio Website for a monthly fee. Every couple days, the company sends an email announcing the upcoming live sessions and currently trending classes. This is smart: It encourages people to use the service by continually introducing them to new course, and it also gives its customers the chance to see what others are interested in learning. Use your newsletter to build a sense of community, whether that’s by announcing events, webinars, Twitter chats, etc., by highlighting user activity, or both. Create a sense of urgency with a “trending” or “hot right now” feature. If you’re using your newsletter to talk about your product, make sure the information is actually valuable to readers. Now that we’ve covered five exemplars and what makes them successful, it’s time to pick the model that’s most suited for your own newsletter. However, you should also think about the goals you’re trying to accomplish with your newsletter. So, let’s say you’re most focused on goal no. 1: alerting your users whenever you roll out something new and/or driving sales. The Maple model—a periodic, “here’s what we’ve got” email—is your best bet (although you’ll probably want to reduce the frequency from twice a day to once a week or once a month, depending on your product). On the other hand, if you’re trying to develop long-term relationships with your users, build out your brand’s voice, and incentivize your users to visit your site, you’d have better luck with the InsideHook or Levo League format. 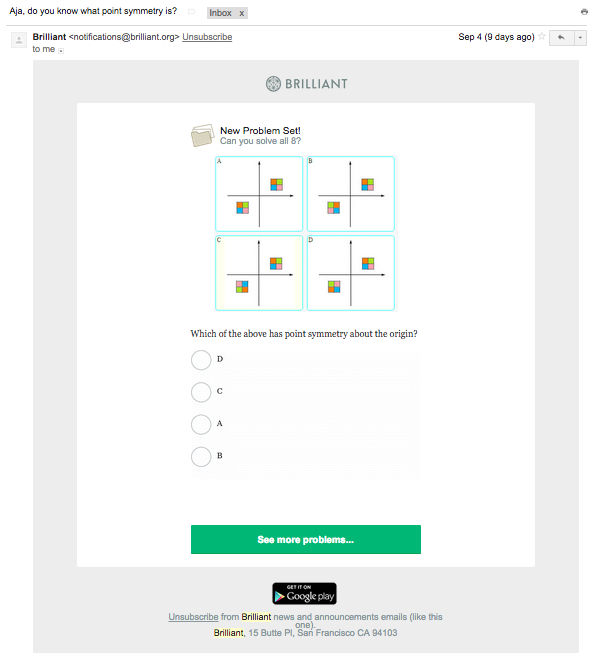 Alternatively, if you want to encourage your customers to use your product, a newsletter like Brilliant’s would be a smart choice. And if you can’t decide between two models? Use the marketer’s best friend, A/B tests, to create two newsletter formats and see which one generates more engagement over a two- or three-week period. 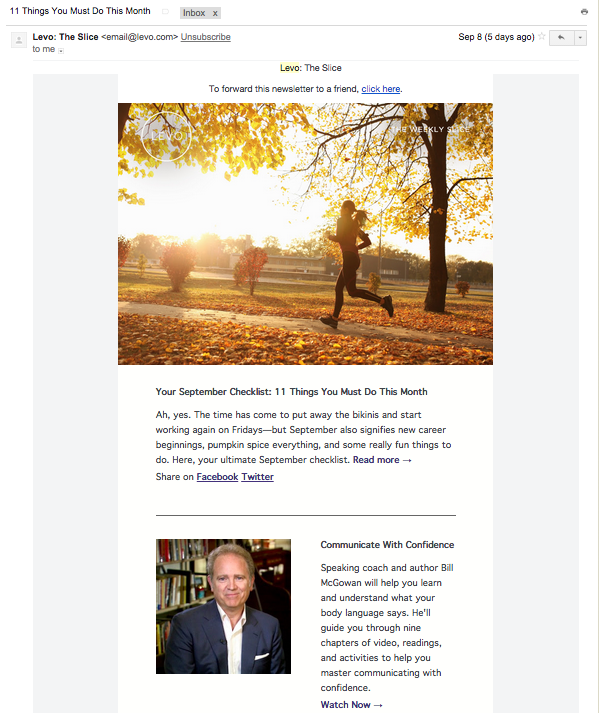 Need a custom email newsletter designed? Launch an email design contest today! This article was originally published on Sitepoint by Aja Frost.